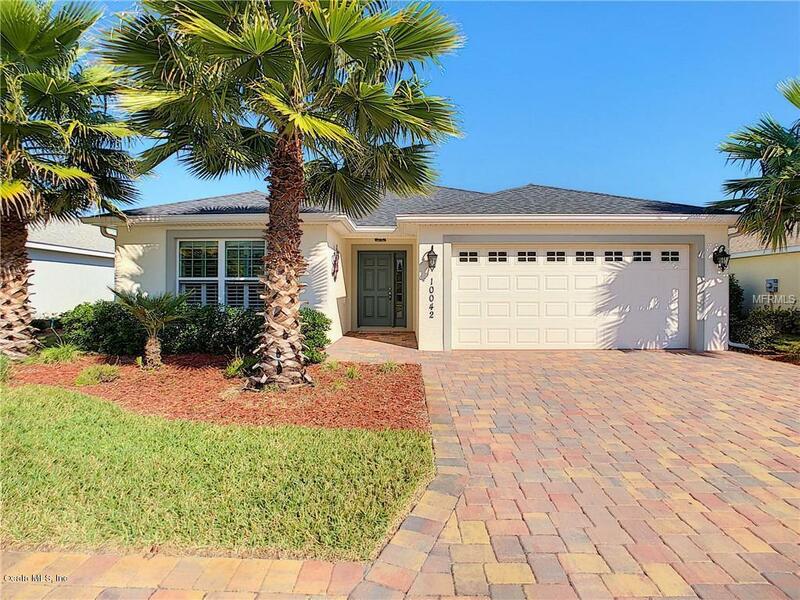 CLEAN & BRIGHT 2B/2B block and stucco better than New home, IN A WONDERFUL RESORT STYLE COMMUNITY of LAKESIDE LANDINGS Central to The Villages, shopping, and entertainment you come to Florida to enjoy. This beautiful home features a long list of upgrades starting with 18'' tile floors throughout living and wet areas, 6'' baseboards, plantation shutters on every window, high efficient thermal windows and doors. Kitchen has wood cabinets with, plenty of pantry and cupboard space, solid surface counter-tops, large eating bar, and high-end stainless Kenmore Elite appliances. Master bedroom has a sliding door going out to the lanai, Walk-in closet and bathroom with double sinks and tile shower.The laundry room has a storage closet and laundry tub w/cabinet.